It’s been one year since we’ve been on the road and so far we’ve been to 25 states. My favorite states we’ve been to so far are Colorado, because it was just so lush and green, and Texas, because…well, I just liked Texas. Now, my least favorite state was Alabama. (Sorry to all the people who live there.) The campground we were at was horrible, the capitol looked like it was completely abandoned, the area we were in was not a very pleasant area, and the skies were NOT so blue! Some of my favorite attractions were Yellowstone, because the mountains, wildlife, and rivers combined were just breathtaking! Bryce Canyon, The hoodoos were so cool! Grand Canyon, it was just so massive and amazing! And, I liked Rocky Mountain for pretty much the same reason as Yellowstone, (they were a lot alike.) The cities I liked were Austin, because during SXSW it was so much fun (and I got a lot of free stuff.) Vegas, the shows we saw there were cool and the light are really colorful. Seattle, because the Pike Place Market, the EMP museum, and the Space Needle were all so awesome! New Orleans, because it was so alive, and I can’t wait ’till we go to all the cities in California!! Right now we’re in Sidney, Montana where there is next to nothing. Our parents are working the beet harvest so my mom is gone from 10:00 a.m. to 9:00 p.m., and my dad is gone from 5:00 p.m. to 9:00 p.m.! This is the only reason we’re in Sidney, and if my mom and dad weren’t working we would most definitely not be here!! On the bright side, there have been kids here the whole time for us to hang out with, while the parents are working, although they are leaving tomorrow. That’s what I don’t like about being on the road. Whenever I meet a friend either we always have to leave or they always have to leave. I also have to share a room with my brother which is not very fun because of the limited space, and he is always yelling at me to pick up my stuff. When the harvest is done we’re heading towards California to work at a Christmas tree lot for a while. I’m excited for that because I heard that my brother and I get to work too! We have been on the road for almost a year now. In trying to find the right word to describe it, I chose: interesting. Don’t get me wrong, I’ve been having the time of my life. I will admit though that parts of the trip are hard. Living in a small space with three other people can get very frustrating at times. Especially when I have to share a room with Mercy who RARELY picks up after herself! It drives me crazy! I also miss all of my friends and family back home, but it’s not like I’ll never see them again. In spite of all the hardships, I am having a great time. We have seen and done so many things that some people unfortunately never will. I don’t think that I could just choose one part of the trip to be my favorite because it has all been so awesome. A few of the most memorable experiences were hiking in the Grand Canyon, seeing the Carlsbad Caverns, and watching a wolf chow on a dead elk in Yellowstone. It was not all woods, caves and canyons though. I also had a great time at Universal in Orlando, Florida. We also saw Smash Mouth in Tillamook, Oregon. Then there was BurntWoodsStock. See my mom’s post: “Summertime,” for more information on that. Yes, sometimes it is hard, and sometimes I am in a bad mood. But all the good things far outweigh those occasional less than fun times. If I was asked if I ever regret going on this trip, I would not hesitate for a second before giving you my answer. Which is: no. Summertime Blues just hit me. Not because of the weather as I do so enjoy the crispness of the autumn air and the beautiful colors the season brings with it. Here in Montana (where we are working a sugar beet harvest until mid-October), it’s almost as comparable to Maine…..almost. But let’s be factual here. Living this nomadic lifestyle allows us to chase the warm weather and enjoy summertime climates year round. So what’s the deal? Why so blue? I’m missing something that highlighted my summer in more ways than one. I’m missing the celebration of happy people gathering together amidst the trees and fields, under the sun and stars to celebrate life and love in the form of music. I’m missing BurntWoodsStock. Family, live music, nature, people, local food, and quality beer. 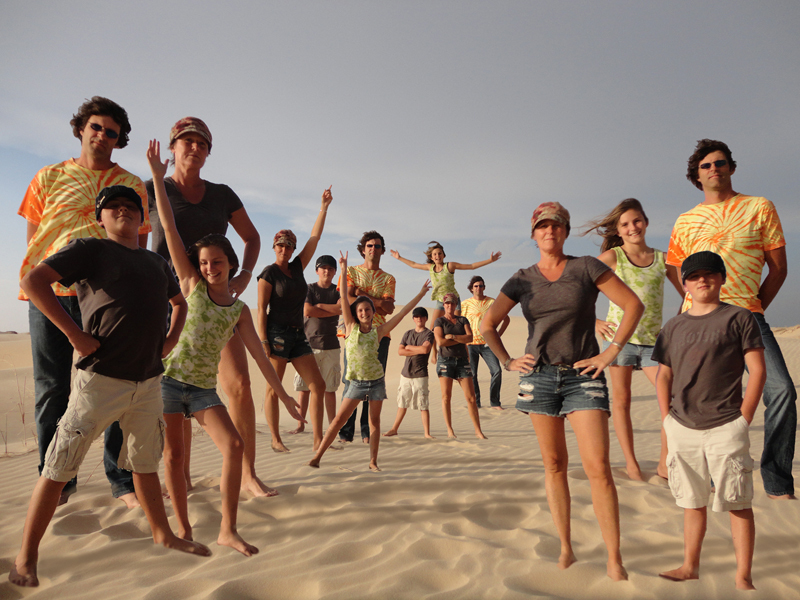 If you know us, you’d agree that those are the elements that make The Dunns “Happy Campers” ! So, when we stumbled upon an opportunity to volunteer at a 3 day music festival in the Burnt Woods of Oregon, we immediately jumped on it. (Well, I did the jumping. They had me with the name as I’m a sucker for anything relating to the flower power era. Bri, on the other hand, needed a few more details of what I was signing us up for). The festival was created four years ago by James and Julz Kasner, musicians themselves, who wanted to share their vision of an all ages family oriented gathering down on Kasner’s farm. Well, their vision turned out to be a successful one and for 3 days in July, a variety of regional and local bands show up to do their thing! Whether it’s rockin, groovin, swingin or jammin, hippies and hipsters alike all gather together for some soul singin! And the four of us were fortunate to get the chance to be a part of all this magic. I corresponded with Julz via email months prior to the event and I knew without even meeting her that she was an energetic soul oozing with kindness and personality. My feelings were confirmed upon our arrival at the farm when we were greeted with smiles, hugs, a headful of blonde dreadlocks and a baby blue canopy. (See Bri’s post, “Final Thoughts On The Ranch, A Comedic Interlude Part 1”). Amazingly enough, she knew all of our names. Mercy immediately became a big fan! After we set up camp in the field with the other volunteers and vendors we went to the information tent to sign up for our duties. Enter… MrWavyGravyMadHatterPsychadelicJesterMan and volunteer headmaster…Kevin. A tried and true BurntWoodsStock head, (I believe he is still wearing his bracelet), he and his wife Chris were our super supervisors. Never a dull moment at their camper… aka… registration booth, security center, ticket counter, supply closet, and volunteer meal shack, they kept things pretty well-organized on very little sleep. Bri, Riv and I took gate duty. Mercy, at her request, was assigned to the kids area and that is where she remained the entire time. She kept busy crafting and gaming with the little ones. We saw her when she got hungry or when she decided a hula hooping break was in order. Our gate shifts were a mere 4 hours, leaving us ample time to play. Naturally, Bri and I hit the beer tent where the owners of Rusty Truck, poured us a mighty tasty IPA. River decided he would hang out with the wood fired pizza guys. It didn’t take long for him to become a repeat customer. We also became quite friendly with the merchandise vendors. It was great to see folks, mainly families, peddling their goods to people who appreciate supporting “the little guy”. The tie-dye family was very popular. They kept everyone colorful and comfortable. There’s nothing like being able to see and hear live music for 12 hours a day to keep your mojo going. Not being from the west coast we were unfamiliar with pretty much all of the bands but that didn’t matter. Each one put on a spectacular performance and kept the crowd singing and dancing well into the night. Oh, and I can’t forget to mention the impressive fire dancers whose mesmerizing performance left you in a daze. And the belly dancer who put you in a trance. Talk about keeping you entertained between band changes! Bri and I took in as much as our bodies would let us. ( It’s not like the old days where we would dance until the sun came up). We both agree that our favorite was, ironically enough, The Sugar Beets, from Eugene Oregon. What sets this festival apart from others is what happens on the last day. This is when local teens are given the opportunity to take the stage (some for the first time) and showcase their musical talents. I truly admire James and Julz for seeing how important it is to provide a venue for our youth. We witnessed some amazing talent and it’s highly likely that some of these kids may find themselves as future BurntWoodsStock headliners. I can’t imagine the amount of work and time that goes into planning and pulling together an event of this caliber. My wish is for its continued growth and success and that we will be able to return in the years to come. Until then, I think we’ll just head to California, where there just may be a cure for the summertime blues. Have you ever experienced the majesty of Glacier National Park in Montana? I have, but my plan for the first day we were there did NOT include throwing up outside the visitor center, the Ranger telling me to move into the grass, and spending the whole day sprawled across the back seat reminding my family every 5 minutes that I didn’t feel good. Besides all that, Glacier was amazing! The second day there we planned to do a hike, but the one we wanted to do was along the Going-to-the-Sun Road, which we already went on, so it would be the same view. (Not to mention it was really windy!) The Going-to-the-Sun Road is the most famous road in Glacier. It runs from the west to the east entrances. On that road we saw 2 mountain goats and 2 bighorn sheep.They were so cute!!! So that day we just drove around the park and stopped to take pictures and admire the views. Scientists predict that all the glaciers will be gone by the year 2030. They are all melting faster than they normally would, because of Global Warming. One of the glaciers we saw was called Jackson Glacier, it was absolutely breathtaking! There were also unbelievably clear lakes. My favorite was called Lake McDonald, which is the largest lake in Glacier. It was formed during the last ice age ten thousand years ago. Huge glaciers slowly pushed down the mountain taking rock, dirt and other debris with it, when the ice melted it became Lake McDonald. The last day we were there we finally did a hike. It was called Avalanche trail because it leads to Avalanche Lake. The hike was 4.8 miles round trip and it was very cool. When we come off the trail we saw a big lake surrounded by mountains and one of the mountains had a massive waterfall flowing off of it. On our way back down, the people in front of us said there was a bear that had just crossed the trail 4 minutes ago. I guess we were too late because we didn’t see it. On all 3 days we were there we went on the Going-to-the-Sun Road. The weather there was nice, but I would’ve liked it a lot better if it wasn’t so windy.